Built in 2006 by Lazzara and consistently refit throughout the years, the custom built 110ft Motor Yacht Le Reve sleeps up to eight guests in four luxury cabins. With sleek lines and a stylish décor, Le Reve offers an excellent arrangement of indoor and outdoor facilities as well as an attentive & professional crew of four. 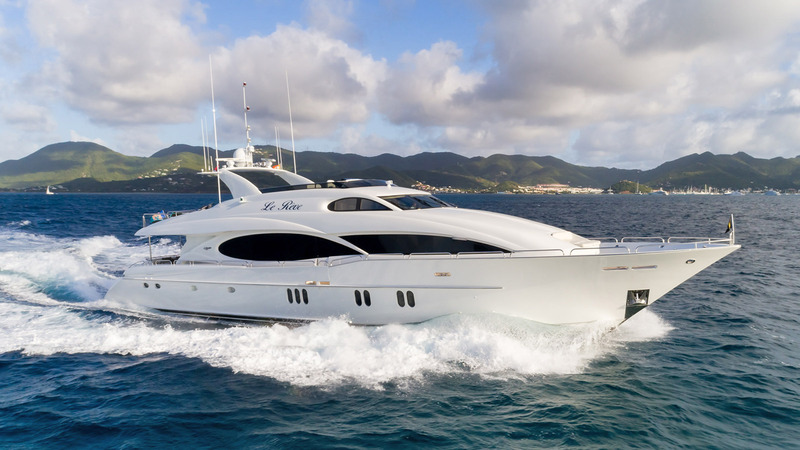 Her shallow draft makes her a perfect fit for cruising the Caribbean and Bahamas, as she is capable of visiting picturesque bays other yachts of her size could not. Le Reve is all about entertaining – the huge fly bridge features a large Jacuzzi, sun mattresses, bar, lounge area, electric grill and an impressive sound system. Dine al fresco on the main aft deck which comfortably seats eight guests on the beautiful table. The aft deck includes full bar and satellite TV. Enjoy formal dining next to the main salon with its plush Italian leather sofa, home theatre system, granite bar and games table. Her interior features high gloss cherry and over-sized windows giving wonderful panoramic views while at sea or anchor. The full-beam Master Stateroom is fully equipped with king size bed and ensuite bathroom with jacuzzi and separate shower. This room offer such amenities as vanity, sofa, double door entry, and 3 large fixed windows port/starboard. The VIP Stateroom easily accommodates 2 guests with a luxurious queen bed and ensuite bath with shower. Galley – Large Country Kitchen great for family gatherings. The open Fly Bridge is the perfect space for entertaining. This expansive area includes: Jacuzzi, sunpad, 2 x banquette port/starboard each with cocktail table, Corian topped wet bar/ 4 stools, Miele electric grill, 3-zone sound system with separate volume control and 6-stereo speakers. Step aboard LE REVE and take a 360° tour of her stunning interior.